or click on a link in a specific game summary below to see photos of that game. Follow these links to the Idaho game summaries on the BSL website. Lots of details! Jr. Urekar, Nick Butterfield, Bryce Hodson, and Curtis Oliva combined to throw a three-hitter allowing just one unearned run, with four strike-outs, one walk, and stranding three on base. 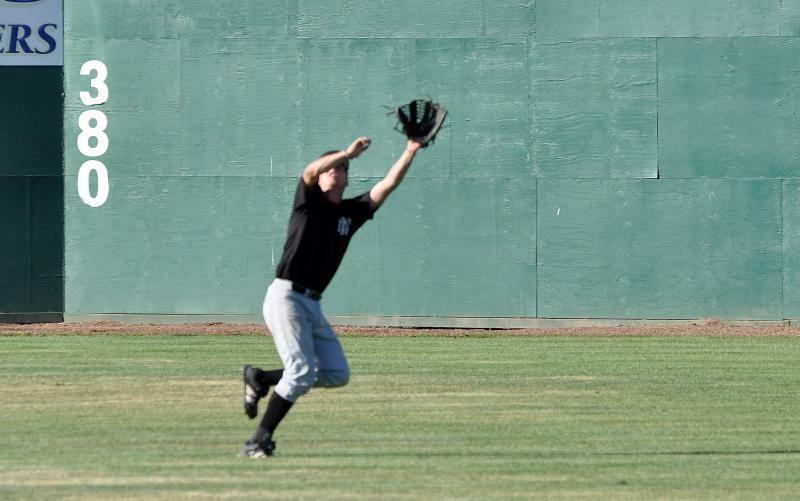 The Flyers’ defense provided great support with nine infield ground-outs and six flyball outs. 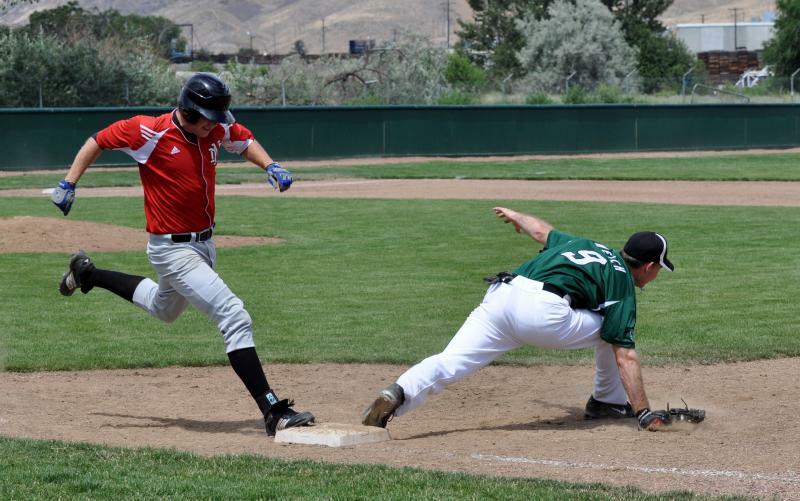 Catcher Kaleb Spencer fired a throw to second catching a steal attempt for the second out in the seventh inning followed by a pop-up to Anthony Allen at second base for the final out. The Orioles’ pitching and defense played tough holding every Flyer batter to one or fewer hits apiece. Urekar started the game with a double in the lead-off spot, but the first Flyer run came in the second inning with a single by Oliva who scored on an RBI single by Scotty Podruzny two batters later. Back in the line-up after a year away for college ball, Greg Hata hit a triple in his first at-bat and scored two batters later on an RBI single by Butterfield for the Flyers’ last hit and run. The Northwest Flyers next game will be against the Portland Flyers on Saturday the 25th at 2pm. Mark Grange debuted on the mound for the Flyers taking the first two innings followed by Nick Butterfield, Will Packard, and Jared Copeland. The pitching staff allowed a remarkable two hits and struck out eight, but walked eight, hit three batters, and allowed four runs while stranding 12 Yankee base runners. Despite four errors, the Flyers defense did a great job getting 12 outs. Ryan Hill started the scoring in the first inning with a single and two stolen bases followed by Nick Butterfield who was walked then scored, and Ryan Holsten who singled. Kaleb Spencer scored run number three in the second inning and Neil Gregg walked and worked his way home for number four. The runs came on heavy again in the fourth inning as Trevor Fink drew a walk then stole second and advanced to third on an error that put Jared Copeland on base. Hill followed with his third home run of the season. Fink crossed the plate again in the sixth inning followed by Butterfield who scored on a double by Holsten. The Yankee defense also made several outstanding plays including chasing down fly balls, leaping to pull in throws at first base, and terrific efforts by short stop Keith Tilley who assisted in seven put-outs. Ryan Hill had a great day at the plate going 3 for 3 with a home run and 5 RBI along with Al Miller who was also 3 for 3 with a double and an RBI. The Flyers rang up three runs an inning through the third, but were shut down in the fourth inning by new AppleSox pitcher #25 who struck out four, allowed two hits, and stranded four on base. Ryan Hill showed great control as he took his turn on the mound for four innings allowing only one run on two hits, two walks, and striking out four with nice defensive support including a second double play. The Yankees challenged Dion Tobia in the last two innings hitting two singles and two doubles but scoring just two runs bringing their total to six. 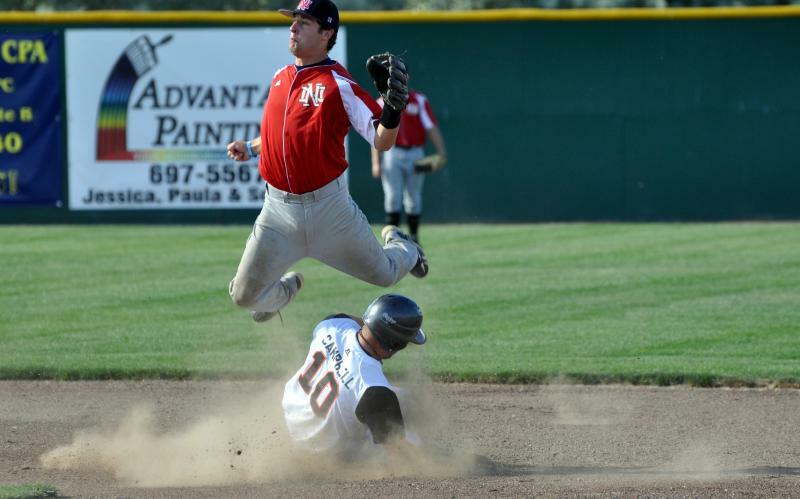 The Flyers cranked out ten runs of their own, scoring in all but two innings. Bryce Hodson, Anthony Allen, Ryan Holsten, and Curtis Oliva rang up doubles while Sam Glazier, Ryan Hill, and Pat Bauer contributed singles. There were a dozen great plays in game two of the Flyers' opening day, but the headliner has to be the history making back-to-back-to-back homeruns by Ryan Hill, Bryce Hodson, and Anthony Allen. It was a slug-fest Saturday night in game two of the Flyers Opening Day as they faced the Orioles in a nine inning game. Both teams hit the heck out of the ball, but the Orioles came out on top with a score of 25-18. Ryan Hill got off to a great start for the Flyers striking out four in the first two innings while giving up three hits and several walks resulting in eight Oriole runs. Jared Copeland took the mound to face the last three batters in the third inning giving up one hit. Copeland ran into trouble in the fourth walking just two, but giving up four hits and allowing six runs on one Flyer error. Trevor Fink relieved Copeland and held the Orioles through the fifth and six innings, with the help of great fielding support, allowing no hits, walking one and striking out one with one Flyer error. Al Miller took the mound in the seventh giving up four hits, walking four, and striking out one and allowing eight more Oriole runs before being replaced by Dion Tobia who finished the inning against the last three batters stranding two more on base. Tobia pitched the last two innings of the game allowing four more runs on three hits, two walks and three more Flyer errors as the Orioles fired several shots at third-baseman Scotty Podruzny who battled back with a web-gem worthy catch and throw from the seat of his pants in time for the out at first. Though they couldn’t match the run production of the Orioles, our Flyers put on a hitting show of their own starting with a single by lead-off hitter Jr. Urekar. He was followed by Dion Tobia, Ryan Hill, Bryce Hodson, and Anthony Allen – all safely on base with a walk or hit and all scoring in the first. Jr. led off in the second with a big home run putting an end to Oriole pitcher Campbell’s outing. Pitching next for the Orioles, Rigo Rodriguez was tough against the Flyers allowing only three runs through the fourth inning on four hits, three walks, and striking out five with one Oriole error. Trevor Fink started the fireworks in the fifth inning hitting a triple off of new Oriole pitcher Justin Burton. Hill, Hodson, and Allen followed with back-to-back-to-back home runs and Al Miller kept the rally going with a triple, scoring in the same at bat on an over-throw at third base. Derek Kihn rang up one more single and scored the last run of the inning for a total of six in the fifth. Burton found his groove nearly shutting down the Flyers in the last four innings allowing only four runs on six hits, including another triple by Fink and a double by Pat Bauer, and striking out three. It was the perfect summer day to start the season as the Flyers faced the Toppenish Yankees in game one on Opening Day. ﻿﻿Game photos﻿﻿. To add to the fun Ron's Coin & Collectibles, long time sponsor of the Flyers, passed out comic books and baseball cards to all the young fans. The Flyers and Yankees continued their on-going rivalry Saturday to see which team would break the 2-2 wins-to-date tie since they began meeting on the field in 2010. Bryce Hodson was tapped for the start and quickly created drama by hitting the first two batters. The excitement peaked with a run-down and the tag at home when Yankee lead-off hitter Fernandez got caught off third base. The action lagged during the Flyers’ first at bats with only one hit by Ryan Hill, but picked up again in the second when Yankee Maldanado hit a double and worked his way to third during the next two at bats only to meet the same fate as his teammate by getting caught in a rundown and was tagged at third by short-stop Jr. Urekar. The Flyers took advantage of two Yankee errors and a walk in the bottom of the second to put up the first runs of the game with help from a single by Urekar. They scored three more runs in the third on two quick singles by Hill and Hodson followed by walks for Jared Copeland and Anthony Allen and another single from Pat Bauer earning him his first two RBI of the season. The Yankees also put together two good innings in the third and fourth scoring a total of six runs as five more batters were hit by pitches or walked, one made it to base on an error, and three hit safely on with singles while four more struck out. The Flyers held them for two more innings as Hodson struck out three of the next six batters, giving up no hits. 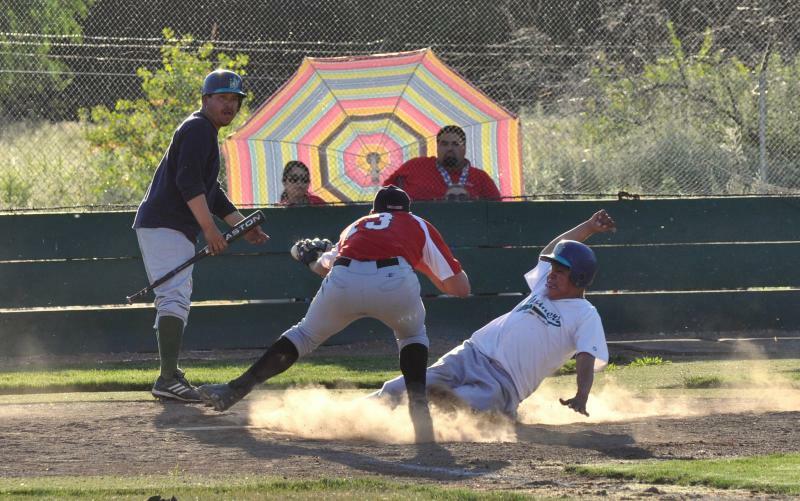 The Flyers took their share of lumps at the plate getting hit three times in the fourth inning setting up two runs. Two more runs were scored in the fifth on three walks and another single by Hill with four strikeouts giving the Flyers a 9-6 lead. That would be the last of the scoring by the Flyers as the final six batters would get just one hit (Urekar) and three strike outs. The Yankees took up their bats against relief pitcher Ryan Holston at the top of the seventh. Holston gave up four hits and three walks allowing three runs in the seventh before the third out on a nice throw from left-fielder Ryan Barber to Allen to cut off a run at the plate. The Yankees continued scoring in the eighth leading off with a single, getting safely on base on an error, and scoring another run before Treavor Fink came in to replace Holston. Fink brought an end to the Yankees success when the next batter attempted a bunt that was tossed to the catcher for a force at home cutting the run. Fink struck out the next batter on a disputed call which resulted in an ejection then gave up a hit to center that Ryan Hill drilled back to home in time to tag that runner for the third out. Another dispute followed ending in a second Yankee ejection leaving them a player short and ending the game on a forfeit at a score of 11-9 Yankees. An unfortunate ending to a great game left both teams looking forward to their rematch next week.